Members of the Sudanese diaspora and others from across the UK took to the streets on Saturday 6 June to protest against the Government of Sudan’s attacks on civilians in the Nuba Mountains, Blue Nile and Darfur, and its repression and human rights abuses throughout Sudan. 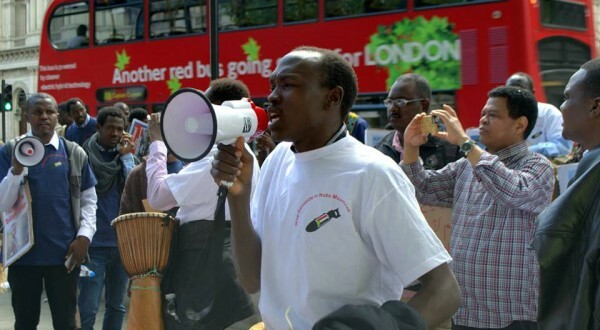 Protestors called for peace and justice in Sudan and for action from the UK Government and wider international community. Parallel protests took place around the world, including in Washington. 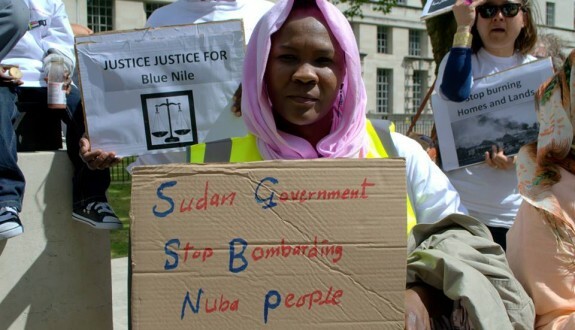 The protest marked the four-year anniversary of the outbreak of conflict in the Nuba Mountains (South Kordofan), Sudan. The conflict, which broke out in June 2011, has been characterised by persistent aerial bombardment of civilian areas by the Government of Sudan, often targeting schools, hospitals, marketplaces, fields and homes. More than 3,000 bombs, including cluster munitions, have fallen on civilian areas since April 2012, an average of three per day. The situation is repeated in Blue Nile State. In both areas, attacks have catalysed a humanitarian crisis, but the Government continues to block humanitarian access to those in need. 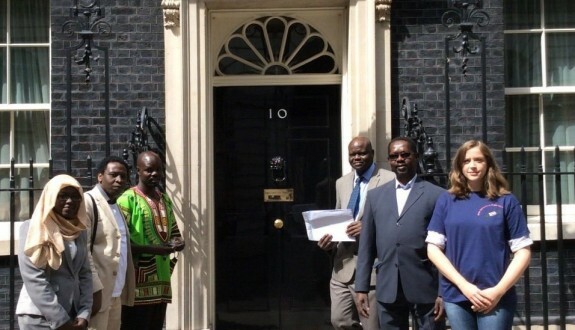 The umbrella group Nuba Mountains Civil Organisations in the UK handed a letter to Prime Minister David Cameron at Number 10 Downing Street asking him to focus on improving the humanitarian situation instead of negotiating political settlements that are likely to amount to “broken commitments” from the Government of Sudan. A full copy of the letter can be found here. 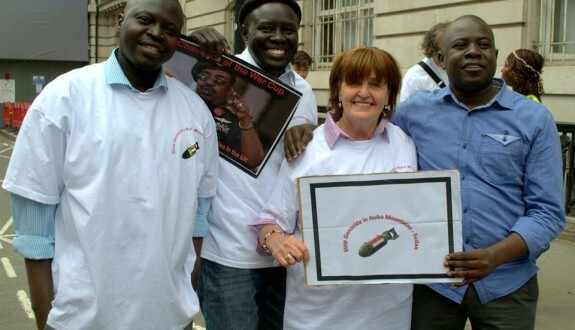 Baroness Cox, CEO of the Humanitarian Aid Relief Trust (HART), a humanitarian organisation working through local partners in South Kordofan and Blue Nile, said, “the British Government and the international community must take action to stop the Government of Sudan carrying out these genocidal policies with impunity”. The backdrop to the protests is an escalation of attacks on civilians in South Kordofan and Blue Nile since April this year. In April, there were 55 verified incidents of bombing or shelling of civilian areas in South Kordofan by the Sudan Armed Forces (SAF), killing ten people and injuring 19. Livestock were also killed and homes burned. Between 1 and 15 May, attacks by the SAF and the Rapid Support Forces (RSF), a government militia, displaced more than 26,000 people in South Kordofan. 6,700 of these were displaced by a ground attack on a prominent market, Al Hadra in Dalami County. This is a key location, as it provides important access to essential materials, food and supplies to communities in the central region of the Nuba Mountains. Houses and food stores were burnt and looted. On 25 May, two jet fighter planes of the SAF dropped three bombs on Kauda in the Nuba Mountains. The bombs landed on a church/school compound and a residential house, killing one girl and wounding her mother. Another child who was injured in the attack died on 27 May. The same day, a drone flew around the area, circling Kauda several times. These drones provide high-resolution photographs and GPS data. On 27 May, at approximately 7.30am, two jet fighters dropped four cluster bombs in Kauda. All four landed in residential areas, but the sub-munitions contained within the bombs did not deploy properly. In April, Human Rights Watch published evidence that the Government of Sudan had dropped cluster bombs on civilian areas of the Nuba Mountains. At 11am, an Antonov cargo plane dropped at least twelve bombs near the ‘Wednesday Market’ of upper Kauda at the time when it would be most heavily populated by traders and customers, mostly women and children. Three people were killed, as well as a number of livestock. Six houses were destroyed. Local community activists report that government soldiers have been burning villages in Blue Nile since April, signalling a new round of scorched earth tactics. In attacks in April and May, government soldiers have stormed villages, evicted local people and then burned entire villages to the ground. Al Gareeda, the first Sudanese newspaper to break the news about the burning of villages, was indefinitely suspended by the National Intelligence and Security Services (NISS) in Khartoum. In one attack, on 11 May, 500 SAF soldiers attacked the village of Khor Magnza in Blue Nile, displacing 17,000 civilians and destroying their homes, possessions and grain stores. On 13 May, an RSF unit attacked the village of Algeri in Blue Nile, burning down 250 homes and displacing 2000 civilians. On 17 May, a combined government police and army force attacked the village of Mediam Masalit. They closed the schools, destroyed the market and burned the village, leading to the displacement of 3200 civilians. On 18 May government soldiers destroyed the village of Masfa, resulting in 4000 civilians being internally displaced. On 30 May, 9000 civilians were displaced from the area surrounding Deireng following an attack by a government force. Many of those displaced lack food, water and shelter. These attacks, and resulting waves of renewed displacement, will exacerbate the humanitarian crisis already afflicting much of the population of South Kordofan and Blue Nile. Further information, photographs and quotes are available from the HART office. Please contact us on +44 (0) 208 204 7336 or at office@hart-uk.org. A team from HART visited Blue Nile in January 2015, meeting with communities affected by aerial bombardment. A report can be found here and a video just below.